Made from leftover almond pulp from making almond milk. So easy to make and super delicious. Gluten-free with an oil-free option. Recipe adapted from Detoxinista's Easy Almond Pulp Crackers. Preheat your oven to 350F (180C). In a medium bowl, add all of the ingredients and mix well. Scoop the cracker mixture onto a sheet of parchment paper, and place another sheet of parchment paper on top, so the cracker mixture is sandwiched in between. Use a rolling pin to gently roll the dough out to about 1/8" thick. The dough will be very soft. Remove the top sheet of parchment and use a pizza cutter or knife to cut the dough into a grid of crackers. Use a fork to poke each cracker. Pick up the parchment with the rolled dough on it and place on a baking tray. Bake for 25 - 30 minutes until the edges start to brown. Remove from the oven and separate the crackers. You may need to cut them again and use a spatula to release them from the parchment. Remove any browned pieces and set aside. Return the tray with the now spread out crackers to the oven and bake for an additional 5 - 15 minutes until lightly golden and crispy. It will take more or less time depending on how wet your pulp was when you began. 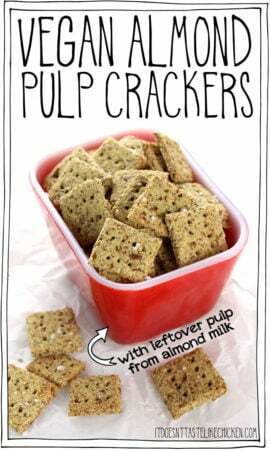 Let crackers cool and enjoy as you please! *For oil-free you can simply omit the oil. I do like adding the oil as it makes the crackers a little crisper, but they are still good without it. **For extra-strong flavoured crackers add an extra tablespoon of nutritional yeast and an extra 1/4 teaspoon of garlic powder.